Samdhong Rinpoche from Portraits of Tibetan Masters by Don Farber, California Press 2005. 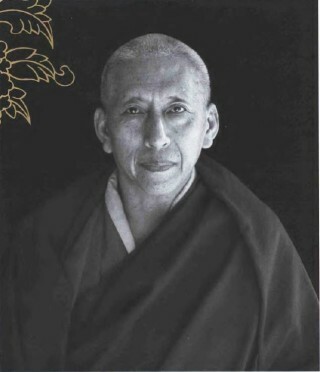 Samdhong Rinpoche is the Prime Minister of the Tibetan Government in exile. He answered a host of questions about refuge, vegetarianism, sectarianism, and greed-versus-need in Helsinki, Finland in July 2007. Q: Can a person be a Buddhist without taking refuge? Is it enough that a person decides in his mind that “I’m a Buddhist” without any formal refuge ceremony? A: Of course formal refuge ceremony is not necessary for anyone to become a Buddhist. But without taking the refuge, I don’t think that you can be a true Buddhist. You may be practising some of the Buddhist techniques or teachings, but you cannot be classified as a Buddhist. The door to enter into Buddhism is through taking refuge. Once you take refuge, then you become a Buddhist; and when you lose/give up the refuge, then you go back into being a non-Buddhist. Taking refuge in Dharma is a necessary condition for becoming a Buddhist, but that does not need any ceremony or a guru or a teacher or guide – you can take it by yourself. Q: Sometimes people take refuge without further thought, so how serious an attitude should a person have when taking refuge? Does taking refuge awaken some old tendencies or qualities, skandhas, in a person? Because sometimes you see that bad qualities appear to be coming to the surface after some people have taken refuge. A: When you are attending a refuge taking ceremony, you are not necessarily really taking the refuge. Taking refuge means that you must have a basic understanding of the Dharma, and you also must have a basic understanding of the misery of the worldly life. And what is meant by taking refuge? It means you establish the faith in your mind that Dharma alone can save you from misery or unhappiness, and for that matter you must have understood that you have a number of sufferings, and you also have a desire to get rid of the suffering. You must also have an understanding that Dharma alone can give you freedom from suffering. If these basic understandings are within you or any person, then the person is automatically taking refuge without taking any ceremony. Otherwise you might have attended a ceremony a hundred times, but you still remain without any refuge. So refuge is a mindset, it is not a ceremony. Q: Sometimes practising Buddhism makes Westerners gloomy and melancholic, as if they had lost their joy of life. What might be the reason for that? Are people expecting too much? Is there some kind of wrong attitude in practising, if this is the result?